FiveStars, a loyalty program for local retailers, has raised $13.9 million in a first round of funding. Investors in the round include Lightspeed Venture Partners and DCM. Other investors include Y Combinator, Mayfield Fund, and angel investors Chamath Palihapitiya and brothers Hadi and Ali Partovi. FiveStars says instead of expecting retailers or consumers to adopt new technology, the product integrates into a merchant’s point-of-sale system, which is that big clunky box sitting on countertops. The approach is similar to how a grocery store loyalty card works. When users swipe a FiveStars card or enter their phone number, the merchant is able to give the customer discounts on individual products, or freebies sometime in the future when a certain spending threshold has been hit. In an interview, co-founder Victor Ho said FiveStars is a little more slick that that. For example, Ho said, the system can automate check-ins into Facebook on behalf of the user, or send email or text message blasts to customers. A user’s profile can also appear on the point-of-sale system, including a picture. Additionally, consumers will like it because it works across hundreds of merchants — not just one. Ali Partovi, who also invested in Dropbox and Facebook with his brother Hadi, said it was the no-frills approach that attracted him to FiveStars. Prior to starting the company, Ho and his co-founder Matt Doka were working for McKinsey & Company in New York, building out loyalty programs for large retailers, including Macy’s. 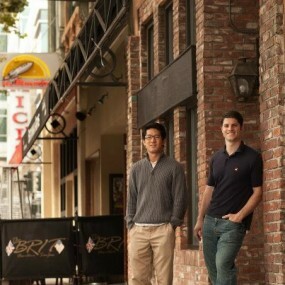 The two then headed west to participate in the Y Combinator class of 2011. 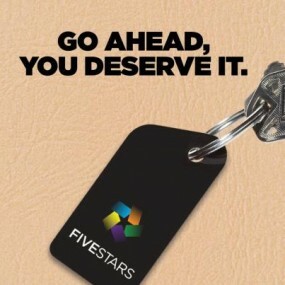 Since officially launching in 2011, FiveStars has signed up 400,000 customers across 11 states; those customers have purchased 3.5 million items and are on track to spend more than $50 million at participating locations this year — those same customers are earning about $100,000 in free rewards every month. At those rates, FiveStars believes it is ahead of the competition. A similar service, called LevelUp, claims to have about 200,000 active users, who are spending some $2 million a month on its network. And Chicago-based Belly, which has an iPad solution, recently claimed to have 1,400 merchants and more than 200,000 active users. Many other services exist, including ones from Pirq and Groupon. Ho says the FiveStars offering is appealing because it is integrated into the computer systems that so many retailers paid big money to own. It also doesn’t require the consumer to download any apps — or to remember to use them. Current customers include local Baja Fresh, Tutti Frutti, It’s a Grind, Round Table Pizza and Metro PCS locations, as well as hundreds of local independent retailers around the country. Merchants pay a monthly fee for access to the platform. Ho said the money will be used to expand aggressively into new markets, and to build out other features, such as an NFC-enabled mobile application. The company has 55 full-time employees. Mountain View, Calif. – August 2, 2012 – FiveStars announced today that it has received $13.9 million in Series A funding from Lightspeed Venture Partners and DCM to support the company’s product development and growth into new markets. The company also announced that it has tracked more than 3.5 million items purchased by repeat customers at local merchants, making it the leader in the $60 billion retail loyalty market. FiveStars is the first loyalty solution on the market to integrate directly into over 90 percent of existing point of sale (POS) systems, making it easy and affordable for merchants to connect with customers based on their in-store, online and social behavior. FiveStars offers consumers a single card that they can use to earn rewards for everything from yogurt to yoga, without the hassle of carrying different cards for different stores. For merchants, FiveStars is an inexpensive and easy-to-use solution that integrates with over 90 percent of point of sale systems. FiveStars cards are accepted at local merchants and retailers around the country, including SUBWAY, Round Table Pizza, Metro PCS, and Baja Fresh locations. Through integration into the POS, retailers also receive real-time tracking and analytics on customer spending habits, to help them customize promotions and rewards. FiveStars requires no extra equipment, such as iPads or smartphones, and includes fraud prevention tools as well as integration with email, text and social networks like Facebook. FiveStars cards are currently available at leading retailers and local merchants across the country. FiveStars was founded in 2010 by Victor Ho and Matt Doka, both of whom advised Fortune 500 executives on loyalty while working at McKinsey & Company. FiveStars has raised $16 million in funding to date. Other investors include YCombinator, Mayfield Fund, and angel investors, Hadi and Ali Partovi, and Chamath Palihapitiya. More information is available at: http://www.FiveStarscard.com/.